We both slept very well last night, we’ve gotten very used to the vibration, it’s just the occasional lurch that wakes us up. Breakfast this morning was eggs over easy and the left over chateaubriand from our “Le Cirque” dinner. It was still very good, a nice way to start our last day on this leg. After breakfast I headed up to the Explorers Club to work on blog posts. There is a great view today of the water, rolling swells with some scattered whitecaps. (Winds are only about 20kts). About 11:30 Susan joined me, we are going to attempt to play the “Team Trivia” The last few days have been won by a team of 6 players. I had listened to the questions a few days ago and they were pretty hard, I only knew 3 out of the ten. We were joined by a couple from Iowa. We did pretty well, we had 9 points out of 15. The winning team only had 12. We missed questions like “What was the name of Alexander the Great horse?” Bucefalus. Should have paid more attention in ancient history class. After “Team Trivia” we walked over to the Captains Corner to play Pictionary. We won, a combination of our team being very good and the other team being pretty bad. A late lunch was burgers from the “Dive In” drive through. The fries were the best part, they had a spicy mayonnaise that added a lot of flavor. The rest of the afternoon was taken up by reading and a nap. Cruising is hard work. We has a quick cocktail at the bar and then headed to the Manhattan Restaraunt for dinner. It was international night, with dishes from around the world. Susan went for an Asian Spring Roll and Italian Risotto with Cod. I had a crab cake to start and cirribian beef pot roast. Dessert for both of us was a kiwi and passion fruit pavlova. A short stop upstairs to the Crow’s Nest trying out some games. Phase 10, a card game, turned out to be too complicated for us to figure out. Pairs of Pears didn’t have instructions. We made it through a round of Trivial Pursuit even though it was missing pie slices. At that point we gave up and headed down to the theater. The show was “Dancing With the Stars: at Sea”. It’s like the ABC TV version, except that cruise members are the stars. It was OK, but we were not fan of “Jazzy”, one of the judges. Every comment came with “It was a Candy Crush, I give you two snaps and a “. He ran through Snicker, Almond Joy, etc. a different one for each contestant. I think he was channeling his inner Marcy. (the woman that screams on “So You Think You Can Dance”). The winner gets a free cruise where all the winners get to participate in the grand contest. A very talented girl won doing the waltz. Since the show didn’t start until 9:30 PM, we were in bed moments after the show ended. Well in as many moments as it takes to walk the length of the ship. There was a walrus tonight on the bed, it was very creative. 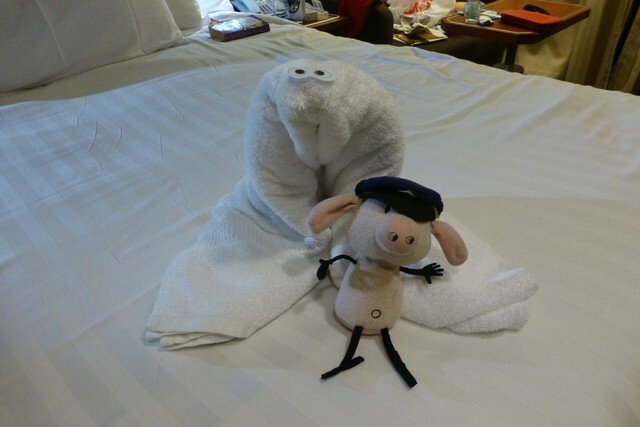 The towels get better and better as the cruise continues. Yesterday our trip to St Thomas took us as far south as we would go on this trip. We’ll now race north about 950 miles to be in Ft. Lauderdale for the next two days. It gives us a break to relax from all the touring that we’ve been doing. On the next leg we will have sea days between the tour days to break things up a little better. Susan figured out how to get fried eggs and I found where the amazing breakfast pastry is set. I had a chocolate chocolate-chip muffin that was very cake like, it was very very good. After breakfast was the second part of my behind the scenes tour. Today we visited ship stores, bakery, pastry kitchen, the full kitchen and prep areas, dishwashing, waste management, laundry and tailoring and the oriental restaurant Tamerind’s special kitchen. I’ll put all the details in another post. (I’m going to geek out, so you can skip it). We had sushi for lunch, it’s made fresh daily, and there were 10 different rolls. For health / safety reasons, they are all cooked rolls, but they were very good. My favorite is the spider roll, it has fried soft-shell crabs in it. After lunch Susan headed up to the explorers lounge to read some and to work on her bead project. The explorers lounge is on Deck 11 and is at the bow of the boat. You have an expansive view of the water ahead. I spent time on our balcony in the sun finishing off my book. Very nice, there is a gentle rock to the boat. At 2:30 I headed down to the sports bar for the International Beer tasting. Because it had not been advertised, there were only two of us that showed up. The bartender kindly gave us both a free beer (we chose Boddingtons) an English Ale. We chatted with the bartender about some of the different styles and beers that we like. After that I headed back to the room for a nap. I had just fallen asleep when Susan arrived from her bead making adventure. We read together for awhile and then watched a movie about P.L. Travers and the creation of the Disney version of the Mary Poppins movie. It was pretty cool, she really terrorized the Disney staff in making them keep to the story. Dinner was at the Pinnacle Restaurant, back to it’s regular menu. Unlike last night where we both had the same thing off the menu, we had different things. Susan started with a lobster soup. The bowl started off with little bits of lobsters and vegetables in a bowl, they then poured a lobster bisque. Having learned my lesson with the 400F soup from the prior night, I went with the dudgeonus crab cakes. They were a cornmeal and crab mix. It came with a lightly flavored apricot sauce that really enhanced the flavors. Susan opted for the 8 ounce fillet, I went for the NY strip steak. Our veggies were Brussels sprouts with a crispy cheese cracker and mashed potatoes. We had three different sauces: béarnaise, horseradish-mustard and garlic butter. Dessert was “A non-traditional Baked Alaska”. It was cherry vanilla ice cream, cake and a whipped soft meringue that had been toasted. It was very good. The evening show showcased the four male singers, the show is called Cantare. The MC said that they were hired to do this show, the other two shows (Garage Band and NYC) were then built around these 4 singers. They were very good, they sang a variety of songs from a number of decades and styles. They opened up with “He ain’t heavy” moved through “It’s a wonderful world”, a number of show tunes, Beach Boys, Beatles and Queen songs. They closed with four Italian love songs, since Cantare means “song” in Italian. I really liked it, I’m hoping they give an encore performance next week. They had a small orchestra with two guitars, a drummer, two keyboard players and a violinist. Rather than having sheet music, they all had iPad’s on stands. I couldn’t see the screens but I’m guessing they all were scrolling automatically with the music. It’s pretty cool the way that small, wireless connected displays have worked their way into a number of different applications. Susan headed back to the cabin and I caught the first set of the “BB King All-Stars”. The room was packed and I ended up standing at the back. There were a number of couples on the dance floor and the band was rocking. I’ve noticed that there is a lot of musical “off roading” that goes on when they play the smaller room. They pretty much stuck to the music when they were playing the concert. I do wish they would play an earlier show so I could see two sets without staying up so late. 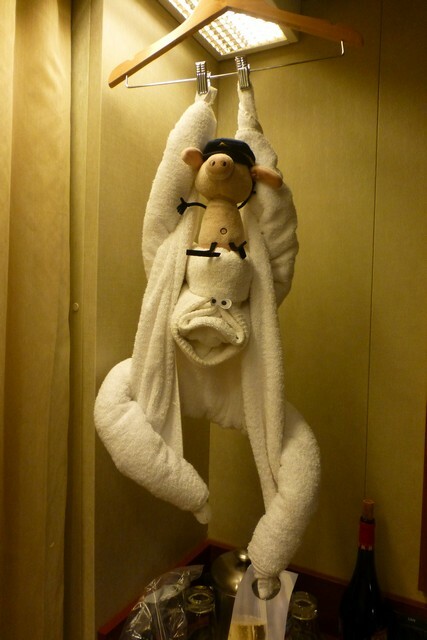 Tonights towel creation was the most elaborate, an orangatang hanging from one of the hangers. It looks like it’s made up of three different towels. 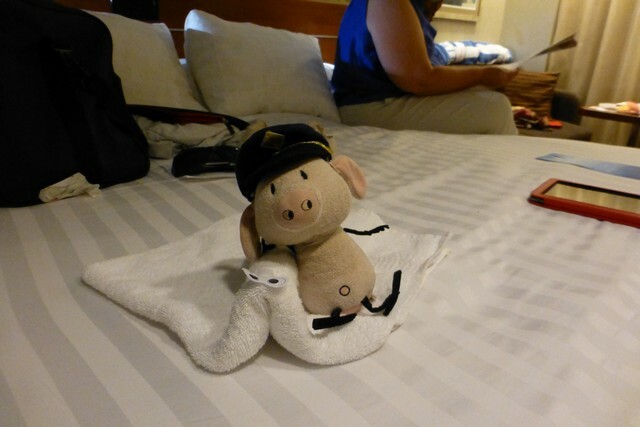 We got a number of good pictures with First Mate Pig. 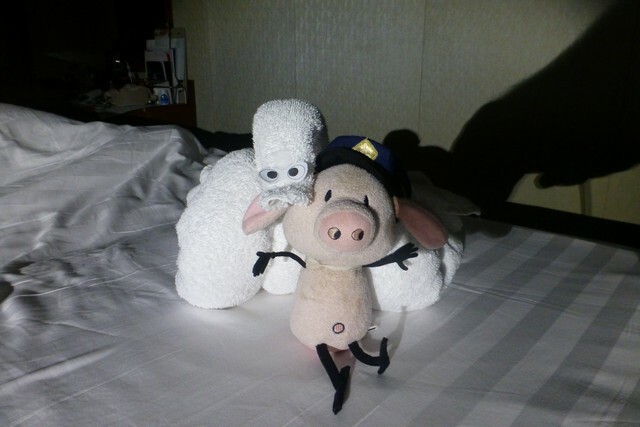 And for the Pig Fans out there, he’s having a great time on the cruise. Today we have a number of things to do on St. Thomas. First up was breakfast, the highlight of mine was eating congee. I did a sample with chicken, beef and fish. The sauces are very good with a little spice, it was almost dinner for breakfast. We disembarked and fought our way through the vendors offering us amazing deals on jewelry and other items. Our tour guide loaded us into a van for our trip across the island to the Coral Reef Beach. The roads on the island are very narrow and loop around the mountain sides. A bonus is that we are in left hand drive cars on the left side of the road. It was a little disconcerting since our driver in an effort to keep us off the side of the road often crossed the middle line. We were soon at Coral World Ocean Park. It a combination white sand beach and marine park. We went in the marine park side and headed towards the Sea Trek, a helmet dive adventure. The helmets look like astronaut space helmets with a handle on the top. We had seen them at the History of Diving Museum in the keys. They weigh about 50 lbs out of the water. It’s connected to a air source via a 200′ hose. In the water the hose supplies air. Because there isn’t any way for the air to escape out the top the helmet it stays full of air. Your head and face are dry as you walk around the bottom. It’s great for me since I can wear my glasses inside the helmet. Because the neck is loose you can actually slide your hand up inside and scritch your nose. They are super simple and first came into vogue with amateur treasure hunters. We climb down the ladder until we are about 20′ below the surface. There is a hand rail that you hold onto that takes you around the coral areas. There is a scuba diver to keep track and there is a diver in a helmet that leads the way. He points out things to make sure that we see. There is a big shelf that you need to squat down to see under. It’s worth it, it’s loaded with smaller, brightly colored fish. The lead guy has a bottle loaded with smaller bait fish. He was surrounded by grouper, yellow tail and some smaller black fish. (It’s hard to ask questions since no sound escapes the helmet) (Like the phrase, “In space nobody can hear you scream” from Aliens. ) Anyway he would squirt a bait fish out and it would be immediately snatched up. The guide would need to use his knee to move the fish away as they became too aggressive. The guide also picks up things off the bottom for us to play with. So we got to touch a lobster, a sea urchin an a starfish. Very cool. It seemed like we had been underwater for just a few minutes, but our 45 minute tour was done. We climbed back up and changed into dry clothing. In the center of the tower we had walked around are two levels. The upper level is a shark tank that goes around the tower. The lower level has view ports that you can see out and see where we had walked. There wasn’t a dive group scheduled for awhile, so we didn’t get a chance to see what people look like with the helmets on. I need to see how Susan’s Go-Pro underwater camera worked out to see how we look. We went through the rest of the marine park. There was a big building with a number of smaller tanks with different kinds of fish in them. Out front was a tank with stingrays hiding out in the bottom. For years I’ve used the term “Off like a herd of turtles.” Today I actually saw a herd of turtles. They have a giant pen an at one end was about 25 red eared turtles hanging out. Very cool! After seeing all the marine exhibits, we got back in our tour bus and headed back the wharf. Dad and Betty had lived on St. Thomas for a number of years. One of his favorite places to go was “Tickles Bar” at the marina a few miles from his home. It’s a well known cruise ship stop, but after they are gone at 4:30 the local crowd comes in. They no longer have buckets of beer, but we did have the local St John’s beer and the best conch fritters that I’ve had. So the sprit of Tickles lives on. After lunch at Tickles we split up. Susan went east to ride the tram up the mountain to see the views. I headed onto the boat to do part one of the “behind the scenes” tour, the second part will be tomorrow. It will end up being a long post, so I’ll save it for later. One thing I did see from the boat was two giant tanks on the dock. They were 150 feet long and about 25 feet in diameter. What made it super interesting was they were on a 40 wheel transport (10 axels per side, double wheels on each axel.) What was neat was each pair of wheels was an independent swerve drive. This let the driver have exact control on where the transport and the tank were going. He was able to make it crab across the dock and then rotate it around the transport axis to position it to be moved off the dock. The swerve drive has been used by FRC Robotics Team 1640 in their robots for the last few years. They have chosen it for the high maneuvering abilities. Being somewhat cheap, I’ve been frequenting the “Pinnacle Bar”. They have $4 glasses of wine and a free appetizer, which makes it my kind of place. (Regular wine in $6.95 a glass, and the beer selection is lame). Today at the Pinnacle there was a huge rainbow off the starboard side. It ran from waters edge well up into the clouds. Very pretty. Tonights dinner was at Le Cirque. Once a week they re-brand the Pinnacle Restaurant something else and bring in cuisine from a famous restaurant. Tonight it was “Le Circ” from NYC. I’m pretty good with paying $80 for dinner for two. And I’ve been known to do $80 a person, most of the time it includes drinks. Tonight, dinner was a fixed price at $79 each, plus wine, plus tip. So we both had high expectations. First up was a amuse bouche of chicken liver mousse over gelled berry juice. Susan loved it, since I’m not a liver mousse guy, it fell a little flat. The salad course was a fresh lobster tail over a circle of three kinds of greens, some grapefruit sections, cooked baby green-beans a and sections of cold finger potato slices. The two different sets of sauces played off the ingredients, each mouthful had some other combination playing off of each other. The central ingredient, the lobster tail tied all of the flavors to give a cohesive set of flavor profiles. Next was a small bowl filled with 1/2 dozen green peas, some small, whole (cocktail sized) onions that had bee blanched and a dumping made of rice flour and parmesan cheese. They then pour in a broth made of fresh peas that have been whisked into a perfect cream like consistency. I had to wait for it to drop from 400F to something I could stick in my mouth without screaming. (In a Restaraunt Everyone can hear you scream) It was very good and well worth the cooling time. The main course was chateaubriand , it was perfectly cooked to medium rare, which makes it pretty rare for most people. Sides were beets with blueberries, carrots an dried currents that had bee soaked. A flan of horseradish was paired with a small pitcher of the beef juice that was almost a perfect gravy. Wow, just wow. The beef was sliced at table-side to give it that extra flair. The beef also had an amazing crust on it, it went the entire way around the beef. I found out in the kitchen tour that they have a special beef press that is a suspended rack has heating elements all around it. A few minutes in the press gives it the all around flavorful crust. Dessert was strawberry Pavlova, but in a non traditional presentation. The meringue was in a ring, and in the center was fresh strawberries. There was also a small pitcher with a strawberry sauce that was very flavorful. The evening show was the “BB King All Star Band” stage show. It’s a glitzier version of their regular shows that we’ve enjoyed. There is more show with the set moving around some and different scenes. It was pretty good, but I think I like the club version a little better. I only got a chance to write part of this before it started to sprinkle. Tonights towel creation was a puppy laying out with it’s paws in front of it. Another over night sail and half the day to get us to San Juan (21 hours to go 335 nm, still faster than the Quo Vadimus. We kept our shadow boat the Eurodam on our starboard beam for the trip. It’s weird not having the internet for news but needing to rely on digests from the NY Times, the Canada press and the BBC foreign news service. If read Dutch or German, I could also have those digests to round out my day. Sadly there isn’t a lot of tech news coverage so that will have to wait until I get interweb access again. On the other hand, having only 16 pages of news to digest, I was able to get by with a small breakfast. I went English style today with tomatoes, beans and bangers. Susan found the oriental breakfast bar and had some very interesting looking items. My new place to hang out is the Explorers Club on the front of Deck 11. The last two days it’s been empty so I’ve had my pick of seats. Sadly today was the trivia contest. It’s normally in the afternoon, but with the late arrival time they have moved all sorts of activities around. Lunch was at Tamarind, the Asian restaurant. For lunch they offer a Dim Sum, but they pick the selection. You have a choice of hot and sour soup or wonton. After that they bring you a salad, three kinds of steamed dumplings along with a few fried items and a huge bowl of vegetable fried rice. There is a selection of desserts you can choose from. I was very happy to find out that the hot and sour soup is wonderful. It won’t replace The Linn’s masterpiece, but it’s in the top 5 versions. The chef has taken the time to make sure that all the ingredients will fit on a spoon. Lots of times there are ends flopping off the spoon. The balance between the hot and sour flavors were spot on. San Juan is a popular stop, so the land tour lines were long, but we got off on our “Old and New San Juan” tour pretty much on time. We were told by our guide that there were 6 ships in port. A pair of Disney boats and the Carnival ship arrived early in the morning. Celebrity was next about 10 AM and the two Holland boats arrived at 1PM. Based on how many people got off our boat and doing the math (the other 4 boats hold 4,000+ people to our 2,100), all told about 15-16,000 people took to the streets. So traffic was a little bit a challenge getting out of the port. But we were soon zooming down the highway from the port and Old San Juan to the newer section with some hi-rise buildings and an upcoming business district. Our first stop was a beach on the northern shore. The “easterly trade winds” come from Africa and hit the eastern end of the island and then are split in half to run down the outer edges of the island. To the east from San Juan is tropical rain forest, the moisture soaked winds drop 120-140 inches of water in that area. The winds in the winter months (like today) rip across the island at about 18-22kts with gusts to 35. It was interesting watching two kite boats fly across the water. If they would do a jump, out of the water the kite would lift and take them 75′ to 100′ across the water. Looked like a lot of fun. Next was winding around the back streets of Old San Juan to get to the fort. The fort had taken about 100 years to construct in the 1600′s and was a major feature to San Juan’s safety. Most of the City was inside the walls. In the late 1800′s a large chunk of the wall from the northern ramparts to the wharf area was torn down to give better access into the city. The fort is massive huge limestone walls and ramps. It had been used a number of times to successfully defend the island. After the fort we were dropped off into a shopping area of Old Town. (Passed gas stations with $0.59/L fuel ($2.10 gal) Lots of little shops and street vendors. But the big guns (MK, Dior, Jimmy Chu and lots of bling vendors) were also well represented. I kind of ignored that and headed to the bar with the $2 beer sign. Susan did pick up some post cards but we mostly watched the tourist throngs undulate down the street. After getting back to the boat and getting our bearings we headed out to the CVS that was doing a land office business of forgotten toothpaste, mouth wash, chocolate bars, etc. We were grimly met with Budweiser six packs for $7.88 where we pay almost that for a single bottle. We found a street side Cafe and had local dishes. I started us off with ground beef meat pies. Lots of flavors and the pastry was firm, not burned, a great envelope for the filling. (names here). It was tender and wonderful. With drinks, appetizers, food, tax and tip it was under $50. A deal! Susan grabbed a small print of San Juan harbor that she liked. She has been collecting these small prints for years as remembrances of trips we’ve taken. At the boat we split up, armed with my iLap I headed over to Senior Froggies for a beer and access to their wi-fi. I was able to check my mail and post 4 quick stories. I had left over time to even do some internet web surfing to see how the robotics teams are making out. Froggies was rocking out and by the end of my hour of time I was ready to roll. It took a few blocks before my hearing got back to normal. 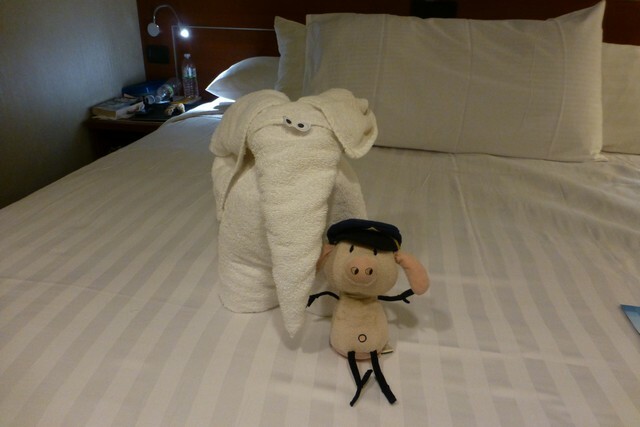 Back on the boat it was towel time, tonights was a huge elephant. Nicely done, this one really took a great deal of effort to make happen. Learning from yesterday we did not order room service, so we were able to sleep in until 6:30. We did the breakfast buffet and continued our unsuccessful process of trying everything. There are way too many things that they offer each day. For Susan the coffee is very good, so that’s making her mornings go pretty well. Unlike other cruise lines, Holland offers an engineering tour of the boat. I was able to sign up for it, it’s during our 6th day (Saturday) at sea. I’m looking forward to it, the tour lasts about 2 hours, I’m sure that I’ll embarrass myself by totally geeking out. We are finding some glitches in the ships communications. They printed the wrong dates and times for some of the events. I showed up to the “International Beer Tasting”, the bartender was very confused, since it does not happen until day 6. Today I went to get the ship board printed paper, and they had reprinted yesterday’s paper again. I guess that is one way to cut costs and keep circulation going. We docked at Grand Turk at the cruise dock. 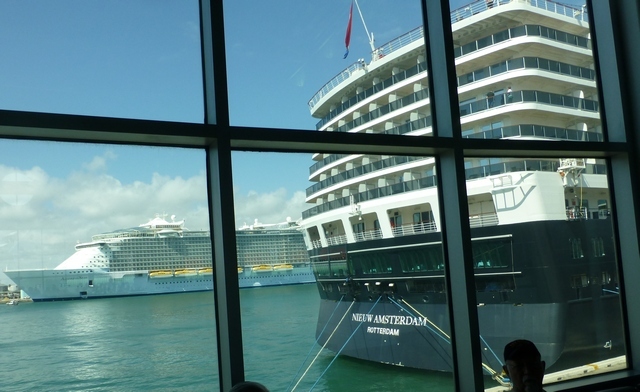 We were sharing it with the Eurodam, another Holland America boat. Our first adventure for the day is a Segway tour of the town that is on Grand Turk. Susan and I love the Segway and pretty much every place we go we try to take a tour. We did the training class, our mounts are the X2, Segways designed for off roading. Unlike other Segways where leaning is enough to steer, on these you move the central post left and right to steer. Helmets on, narration earpieces in place and we were off. This is where the depressing part starts. The island is pretty poor and it has been decimated by storms in the past. Lots and lots of the homes are just a mess. There are a few small shops, but it didn’t appear like there was much selection. On the other hand the dominate item on the horizon is a huge cell and TV tower. The entire island has great cell coverage and most people get internet services via “Lime”. Health care is cheap, gas is expensive (6.15 per gal for diesel), alcohol is cheap and lots of people work for the government or the tourist trade. You can go away to University and if you agree to work for the Government, the school is free. But there isn’t much else going on. Other than that the tour was great and I’d highly recommend it if you are on the island. We didn’t see any other Looper boats or a marina, so we don’t know how long term visitors stay. Our next tour was on a “Semi-submersible” boat. Think of a 45′ Bayliner with glass windows on the inside hull. We took a short boat ride out to the reef that we would be cruising around on. Once we moved over to the “Semi-submersible” and climbed down into the hull, the Captain took us around the reef. We saw about 8 different types of fish, lots of coral and a sea turtle. After about 40 minutes of touring around, a diver jumped in and started feeding the fish. Down in the water the colors are OK, but with the diver coaching them to come to the surface, the sunlight makes the colors POP. Bright BLUE along with vibrant YELLOW. Ok, so there isn’t much you can do with a turtle, but the fish were pretty impressive. The diver then showed off, he blew “air rings” in the water. Fun to watch and sometimes they would link together. On the way back Susan and I talked about the boat, it has a 5′ draft, it would be the perfect loop boat. Or maybe not, with the logs and trash on the Mississippi, there would always be the fear of smashed glass. But imagine going through the locks, the crystal clear water of Canada, dolphins and manatees in Florida. Next up was a quest for a dive bar. We’ve tried to find as many as possible, our last success was on the way home from Key West. I had asked the Segway guides and they suggested “Jack’s Shack” and the local beer. We navigated through the pristine port area and trundled up the beach. (The soft sand is hard to walk through and we walked about 3/4 of a mile. Pick a better word). Jack’s is a great dive beach bar. Volley ball along with beach chairs. A huge wooden deck with tables with bright umbrellas. Cheap beer at $4 a bottle, conch fritters and fries for $10. This is truly a place I could stay at. The local beer comes in Amber, Lager and Stout and they are very good. There is the downside of Holland’s schedule, I could sit here for hours watching the bright blue waters and the hours spin on and on. But schedules are schedules and we are back on the boat by 3PM and soon on our way. Being European, the boat has afternoon tea at 3:30. Today was cupcake day and having a professed love for all things Tasty-Kake, cupcakes seemed to be the thing to do. I started off with Earl Gray tea, chocolate, vanilla and red velvet cakes with icing and decorations. Yum!! Wait there is more! Flan and a fruit tart soon follow. But now I sense that I’m being judged by the “Ladies that have tea” as an interloper. So I lick the last vestiges of sugar off my fingers and head to the stateroom for a nap. I’ll fast forward to dinner (after all this is a food blog). Susan had a seafood appetizer and an amazing piece of salmon. I went with the corn and pepper chowder, my main was the Turks Pot Roast. The calorie counter clicks past 11,000 for the day, but it’s been worth it. Sporting sunburn, Susan heads back to the state room, I head to the “Theater at Sea” theater for tonights show. It’s called Recycled Percussion. It’s hard to describe, it’s four musicians and lots of percussion. Drums, body parts, ladders, etc. It is very loud, but it is very kid friendly and everyone has a great time. I wandered back to the “B.B King All Star Band” show. I really liked them last night, and the first set was really good. The band is hot, and you can see how much fun they are having. The songs in this set were very different than last night and not so many dancers. Could it be that dressed up people dance more? After watching the first set of the “B.B. King All Star Band” I headed up to the Observation deck (where I’m writing this). It’s a nice breeze, there is a soft song with french lyrics in the background and a 1/2 moon above. Across the way is the Eurodam heading with us to San Juan. It was a very pretty day, and this is nice way to end it. 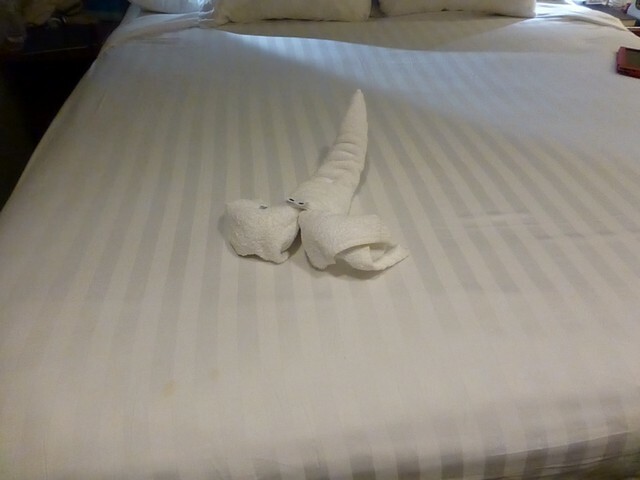 Tonight the towel was a very fancy swan, it took two different towels to make it. The ship steamed 224 nautical miles overnight to put us in the Bahamas early morning. And our morning started off very early. Susan and I had put a breakfast order in for coffee and a muffin for between 6 and 6:30. On the Quo Vadimus Susan is up around 5:30. Today we were both sound, deeply sound asleep at 6AM when the bang came at the door. Expecting a pot of coffee and a muffin Susan was ill prepared for the 2 foot by 3 foot tray table. She had to quickly clean the coffee table off so the waiter could move the tray into place. We’ll try a different plan on Tuesday. The boat made better time than expected, so they were ready to offload people to Half Moon Cay by 8:30. Since we had been up for awhile we were some of the first to get onto the tender. Back in 1990 Holland Cruise line leased a cay from the Bahama government for 99 years for around $6.5 million. They then did about $17 million in work to build a protected harbor, three generators, staff housing for 80 people and a few miles of beach for swimming. Oh and a cell tower. Since then between 4 and 7 Holland and Carnival cruise liners stop each week to drop passengers off for the day. It’s a pretty nice setup, there are chairs, cabanas, a special kids play space, jet ski rental, glass-bottom boat tours and of course, three different themed bars. Your own private beach that you share with 2,000 strangers. In our case, I’ll bet only about 1,000 people got off, so it was not very crowded. Our “tour of the day” was the Eco-tour of the inner lagoon. While we were in a glass-bottom boat, they took great pains to say it was an Eco-tour, not a glass-bottom boat tour. (I think to keep the official glass-bottom boat tour people from getting cranky. Our small group of 8 people set off in our Eco-boat across the lagoon. The lagoon covers 117 acres and is about 5 miles long. Depth ranges from 1 foot to 17 feet. The transparent bottom of the eco boat let us look at a variety of fish, conch, sea cucumbers, and a number of different kinds of coral. It was a pretty interesting tour. The boat ends up at the mouth of the lagoon. There was a incoming tide and it was ripping through the entrance. I asked about the water depth and was told at high tide it was about 3 feet. So much for coming back in the Quo Vadimus for another visit. The water is very, very clear, it was easy to see the bottom, even at the deep parts. The last time we saw water this clear was in Canada. Up there it’s a combination of the lard rock and lack of people. Here it’s the hard coral and lack of people. Guest transportation around the island is via these large trucks with four rows of facing seats. Think of the war movies with everyone loaded in the back of the truck and you have the right picture. Lucky for us the rides around the island are short. We got a ride over to the lunch pavilion. It was a surprising spread with seafood salad, slaw, a tossed salad and a potato salad with mango in it. (Yea, weird on paper, but pretty good to eat) Protein choices were hot dogs, hamburger, sausages, chicken, island style beef and the ever popular veggie burger. After lunch we walked down the beach to the “Captain Morgan Shots Fired” bar. It was a 80′ pirate ship that looked like it had been in a battle. There were large “splintered” holes in the side. Inside was a stage for a band (today was a lone steel drum player working with pre-recorded backing an a large long bar. Upstairs was more tables and a few more steps up a poop-deck with another set of tables. Very festive and pirate like. We sat for awhile looking at the bright blue water and white sand. I can see how people really get hooked on the Bahamas as a place to vacation. From our ship we headed down the beach. The sand is a fine white powder, finer than any other sand I’ve seen. The water was warm and the waves were very light. A picture perfect day at the beach. Our next stop was the “I could stay here forever” bar. A catchy name and it does catch the spirt of the place. It’s located up on the dune and it also has two levels. We were able to score two seats looking out across the sand and across the water to our boat. Very peaceful and tranquil. The water coming in lapping at the shore makes for an almost zen like relaxation. But time moves on and our drinks were gone and we moved down the beach towards the water tenders. We were soon headed back to the Nieuw Amsterdam. When we got closer we noticed that there was not an anchor out, nor was there a mooring ball. I then remembered the special drives and bow thrusters. The boat was keeping itself in position. This brought up new possibilities for the Quo Vadimus, I could replace the drives in my boat and not have to worry about anchoring any longer. Something else to add to the list of things to buy with our lottery winnings. The afternoon went by pretty easily. Susan did another spa thing and I sat by the pool working on the blog posts. (I got a Zagg keyboard cover for the iPad and some really nice local editing software (thanks Miss Linda for the suggestion). The iPad now acts like a mini-laptop and I’m good to go. I’ll find out in two weeks how good the upload part really is when I go to post these on the blog. As I next to the pool, the sunshade closed part of the way. A pretty neat way to deal with the setting sun making it uncomfortable for guests. I was able to get a quick beard trim in before dinner. The salon girl was good, and figured out pretty quick that I was’t interested in the up-sell process. We did a quick dinner at the “Lido Buffet” and then headed to the “Theater at Sea” theater (yea, redundant) for the Captains Toast and to see the show. Since it’s a formal night most people were dressed in suits and fancy dresses. I put on my formal polo shirt (the black one) to fit in. The Captain and his officers are all Dutch. He’s been a Captain of a cruise ship for the last 20 years and has been the Captain of the Niew Amsterdam since she set sail. He’s in his mid 40′s, so he will be around for awhile. I’ll need to look up how you become a cruise ship captain, but I may have missed my window. The dance / musical review was pretty good. The back wall is a Jumbotron screen, so they had backdrops of New York locations. They sang standard NY songs like “In a New York State of Mind”. The stage was a lot more complex than you would think for a boat. The Jumbotron flew up into the flyspace. There was a front elevator that went across the stage it was about 8′ deep. The center of the stage was a turntable and there were three elevators that both went above and below the stage level. They were able to use it for lots of good staging. We had free champagne with the show (Yay Holland) and it was interesting to walk along the slightly lurching hallway to the stern of the boat. About 1/2 way back there was a club with the “BB King All-Star Band” playing blues. They were very good and there were a number of couples that danced. We stayed for their first set. They play almost every night so I’ll get a chance to hear them again. Today’s towel animal is a stingray. It’s super easy to make, take a towel, fold into a square. Now make a 1″ wide diagonal lump across the towel. Add googly eyes at the end of the diagonal and you have your stingray. After a pretty hectic week of activities we were both pretty exhausted. We had finished packing the night before and just needed to take care of the last details of shutting the boat up, making sure we had everything and the all important last trash run. We were on the dock and waiting for our driver to pick us up at 7. Unlike the last trip north to Ft Lauderdale, there was very little traffic. Susan had planned on 3 hours of travel, that would put us right at the Everglades Cruise terminal just as they opened up reservations. With zero traffic on the road we got dropped off a little after 9AM. The registration doors opened at 9:30AM and we were some of the first through the system. For some reason it’s much faster to check in for a boat than an airline. We did need to wait until 11:30 to begin boarding. The chairs in the lounge were very comfortable and we had things to read while we waited. The checkin line was pretty steady, it never looked like there were more than 10 people in line at any one time. At 11:30AM we started boarding. First up was the “Welcome Aboard Photo”, our first chance to spend additional money with the cruise line. We quickly found our room and unpacked our carryon items. I hit my first snag of the day, I had left my sunglasses on the seat next to me in the waiting area. A walk back (like a salmon swimming upstream though the crowd) to the seats. Rats, no glasses. A quick check with the check-in agents also didn’t turn up the sun glasses. Looks like I’ll be hitting the gift shop for some new ones. While I was off searching, Susan had gone to the top deck and gotten lunch started. By the time I got back there was a Bloody Mary waiting for me. The food was very good, we were both very pleased. Back in our cabin our checked items had been delivered. We did the last part of our unpacking and took our first nap of the cruise. We are in the aft part of the boat, so we can feel the engine vibrations, Susan said they were like the magic fingers beds. Needless to say we both slept very well. I was startled awake by the announcement system going off, it was time for our safety drill of the cruise. Soon the lucky people of life raft 17 were assembled and accounted for. After a brief lecture we were released. Our boat the Nieuw Amsterdam is pretty new, launched in 2010. So she has bow thrusters that easily pushed us off the dock. The channel from the Everglades Cruise Dock out to the ocean is pretty narrow and the Coast Guard was busy keeping boats out of our path. There was not a lot of clearance on either side and we watched boats get bounced around pretty good in the wake. We were soon out of the channel and turning north. North?, hey that’s the wrong way, we should be going South. There is a large mooring / anchoring area ahead and we move along side. The Captain announces that there has been a medical emergency and we may be heading back to port to let the person off the boat. On the starboard (right) side of the boat is a retractable platform that would allow tenders to on/offload people. About 30 mins after the announcement a small fire / rescue boat pulls along side to the now extended platform. (A cool center console with a pair of 250 HP Yamaha engines) They offload a small group of people with medical equipment, including one of those portable EKG machines. There are a few more announcements by the Captain that there are medical people aboard and he will keep us posted. About 30 mins after the Fire / Rescue team arrives, their boat pulls along side. They load luggage aboard and a family member. Next is someone strapped into a stretcher carried by 6 people. They move smoothly like they’ve done this lots before and move the patient aboard. The rescue boat moves off and the Pilot boat takes it’s place. The pilot jumps aboard, gives a big thumbs up and they head off. The Captain announces that we will be underway and will be in Half Moon Cay about 9AM, an hour late. Not a big deal since it’s just a beach day. Susan heads off to the spa and I go out on our balcony to read a real “dead tree book”. It’s nice to sit in the sunset, there is a nice breeze with the motion of the boat. There is something a little weird about the boat. It’s got a pretty decent vibration going on. If I was on the Quo Vadimus I’d think that I had a prop slightly out of balance. It may be due to the Nieuw Amsterdam having azipod drives. These are propellers on a mount that does a 360 spin. They can act as forward propulsion, or as side thrusters. With these mounts and a bow thruster the Captain can move the boat sideways. We’ve noticed the vibrations all over the boat so it’s more than us being closer to the engines. We got changed into dinner and headed to the “Manhattan Restaraunt” for dinner. There was a slight wait for a table for 2, we waited in the bar next door. There was duo with a cello and a piano playing, they were very good. Dinner was beef carpachico and NY Strip for Susan, I had “Les Halles” french onion soup and the shrimp and grits with andouie sausage. Their version was less okra more shrimp and it was wonderful. I’m always amazed with the logistics of a large restaurant and this was no exception. Two people at the front desk, three people to run guests to tables. A wine steward, a person to take orders, a drink person (I was drinking beer), food delivery and someone to clear. Topped off by two visits by the section manager to see if we were happy. There were tray after tray flying by with food (and we were at the back of the place, who knows what it looked like closer to the kitchen. I got key lime pie to go since I was pretty stuffed. (I think being stuffed will be a recurring theme across the next 13 days). On the way back to the room I stopped by the central office. There in the Lost and Found bin was my sunglasses. Some kind shipmate had turned them in during the afternoon. Yay! I will have sunglasses for our beach day at Half Moon Cay. 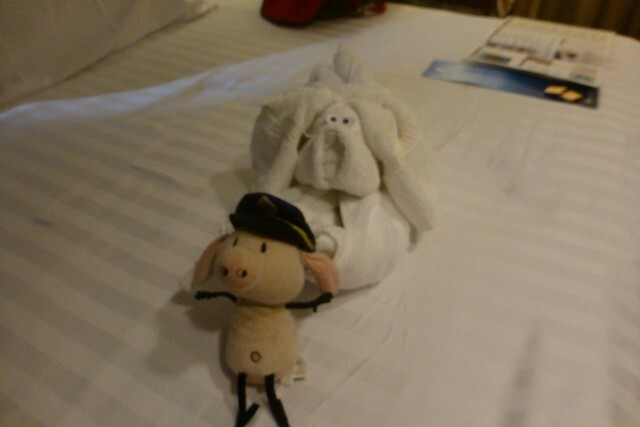 Towel of the day was a walrus with googly eyes, Susan got a good picture with Pig. One of the things about doing the loop is it expands your cruising horizons. Boating in the Chesapeake has us looking a a few hundred mile trips. Boating the loop, a trip of ~6,000 miles has us looking at longer trips. One of the things that becomes reachable is going to the Bahama’s. From South Miami, it’s about a 75 mile trip, easily do-able in the Quo Vadimus on a nice day. One of the problems with the crossing and doing more travel in the Bahamas is the January and February winds are from the north and it can be a little blowy. We checked into it and doing a two week cruise of the Eastern and Western islands (with a short trip to Mexico) was about $100 per day per person. When we totaled up two weeks of taking the Quo Vadimus over, the cost of fuel, food, moorings, dockings, etc. was a lot more. By taking a cruise we could see as much, if not more, and at a lower cost. The side benefit is the cruise boat moves at night. So we tour a place, get on, get dinner (cooked and served to us), go to sleep and wake up in a new place to see. Granted there are two “at sea days”, but we are good at finding books to read, etc. So back in December Susan booked us two weeks of cruising with Holland America. She used a travel agent (Liberty Travel in Pennsylvania) which turned out to be a mistake. Our agent turned out to be a dud and at this point I’d be hesitant to use her to book a kids party at Chuck-E-Cheese. For the last week of February and first week of March we will be off our boat and cruising on a slightly larger boat. One of the requirements of being an uber Geek is having your own web pages. I have a wiki that I use to keep all of my bookmarks and information in a pretty easy to browse collection. It is in need of some pruning so sitting here in the warmth of Tavernier FL I have a chance to do some “wikipruning”. I have a pretty good collection of links back to the Army Corps of Engineer sites to track the locks down the middle of the county. The ACoE Lock Performance System Montoring. It allows you to select what river system you want to look at. It then returns the current status of the lock. Sometimes there are additional comments by the lock master on the wall or gate status, or even a holiday greeting. And sometimes there are pictures!! While many of us have been or will be through the locks during nicer weather, here is some pictures of locks across the middle of winter. Even though we are waiting out winter, the tows are still moving goods up and down the rivers. I’m sure crunching through the ice makes for an interesting ride.